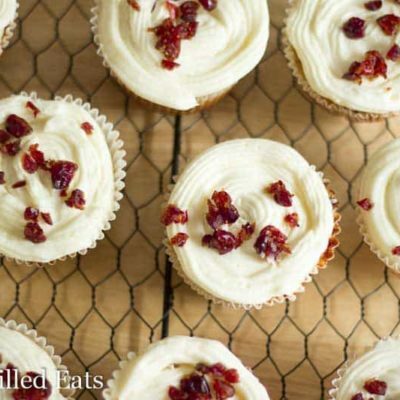 Cranberry Cupcakes really are blissful. Tender yellow cake filled with cranberry sauce and topped with cream cheese icing. I love having cranberry sauce in the fridge. I use it for so much more than just a condiment on turkey. Last week I used it in Baked Brie. When I was asked to bring a dessert to an Octoberfest party we were going to today I wanted to make something with cranberries. They just scream “fall” to me. I made my own version of the famous Starbucks Cranberry Bliss Bars last winter but I had a hunch the same flavors would be great in a cupcake. I love putting a surprise filling in cupcakes and watching when people bite into them. It’s fun to cut them open to see the beautiful color inside as well. These were a hit at our party today. There are several people who need to be gluten-free for various reasons so I’m always happy to be able to bring a dessert they can enjoy. I didn’t even eat one of these there because I ate one and some extra icing after the photo shoot. I needed to taste test them before I could bring them to a party. When my husband and I were in Quebec City in July I was thrilled to find juice sweetened dried cranberries at a farmer’s market. They are really hard to find and it’s almost impossible to find unsweetened ones. 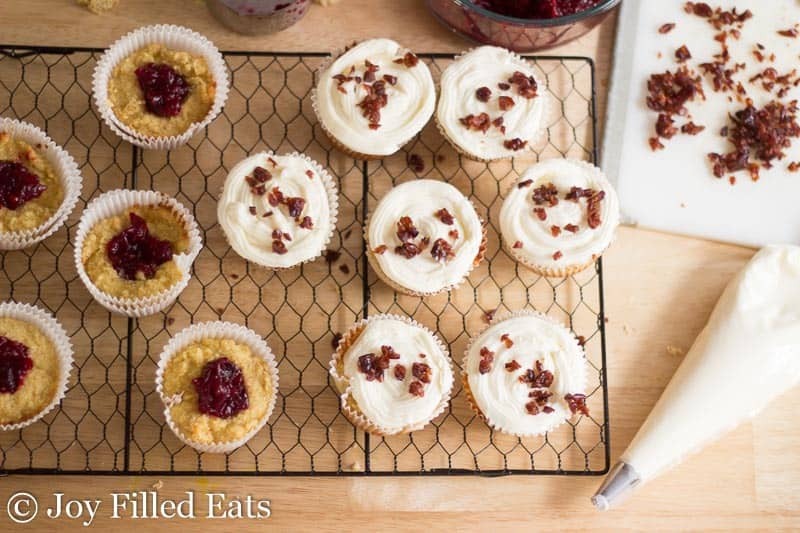 I don’t mind using a few juice sweetened dried cranberries as a garnish on these cupcakes but that is optional. Preheat oven to 350. Line a standard muffin tin with 12 paper liners. 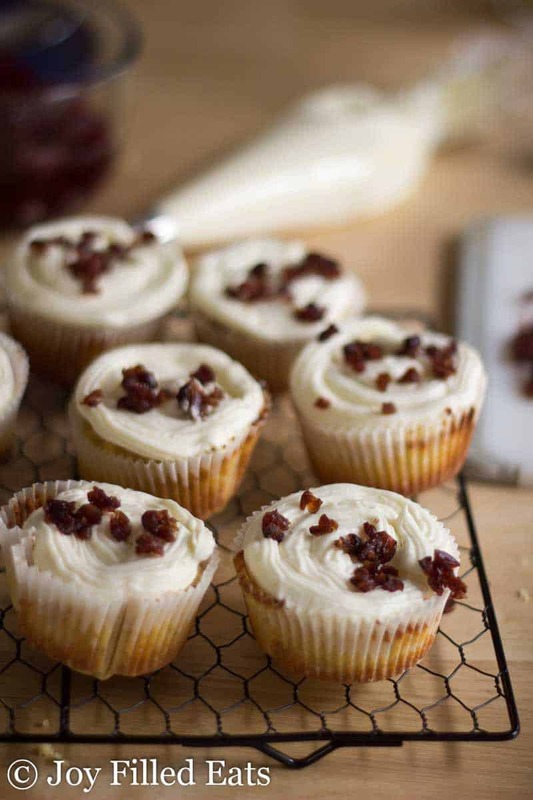 Put all the ingredients for the cupcakes in a bowl and beat with an electric mixer until smooth. Or process in a food processor until smooth. Divide between the prepared muffin pan. Bake for 25 minutes or until the tops are golden and spring back when lightly pressed with your finger. Cool completely. To make the icing beat the butter and cream cheese until smooth. Add the other ingredients and mix until fluffy. To assemble the cupcakes scoop out a tiny bit of the center of each. Divide the cranberry sauce between them. Pipe on the icing. Sprinkle on a few dried cranberries, if using. Fantastic healthy muffins. They are perfect for fall! 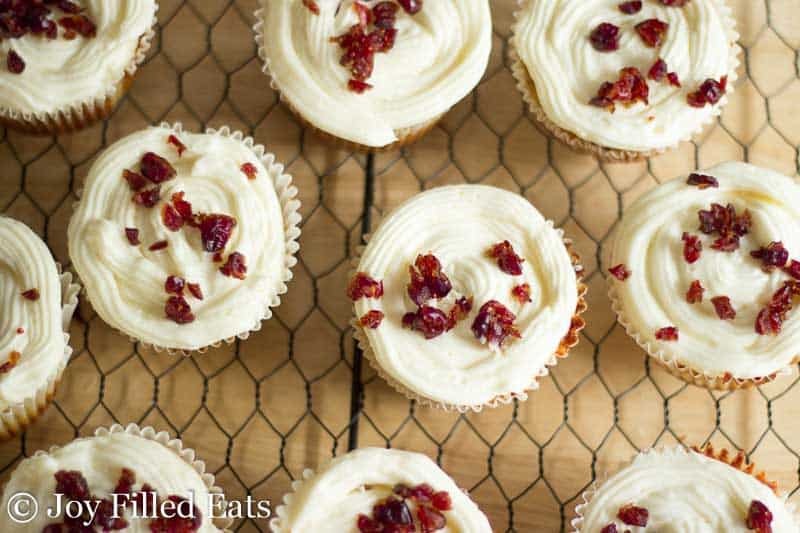 These cranberry cupcakes look absolutely perfect and just at the right time for fall! I just made this for Christmas in cake form, and it was great! I doubled the recipe, made 1 1/2 times the cranberry sauce (which was too much)for filling, and made the the suggested frosting. I didn't increase the amount of frosting, and I was afraid it wouldn't be enough. I added some extra whipping cream to increase the volume, and it still tasted great? Next time, I will remember to increase frosting by 1 1/2 times also. The cake texture was amazing! I will definitely be making this again! Thanks for a great recipe! Oh my, these look delicious! I'll give them a try this Thanksgiving! Thank you so much for submitting your recipe to DIY Crush! I just published it! Can't wait to see your next submission! These are beautiful! I love surprise-filled cupcakes! Aaah, cranberries! It is that time of the year again.... lovely. Your recipe sounds very delicious. Shared! These look perfect for the holiday season! I love that you bring your low carb goodies to get-togethers for others to experience just how tasty healthy eating can be! Very cool. Looking at the pictures, you'd never know they were actually good for you! I BET these were a hit at the party. 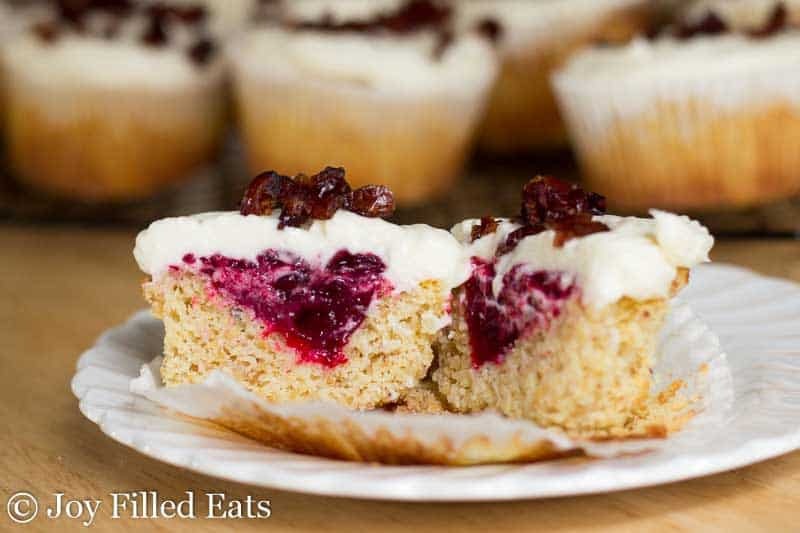 I love cranberries and these cupcakes sound every bit as good as the cranberry bliss bars you mentioned. I don't know about you, but I can't wait for the bags of cranberries to hit the stores every year!